Young dads aged 14 to 25 can drop-in with their children and enjoy group chats, food and childcare. It's free and every Wednesday. The Young Dads Drop-in will help you make the best possible decisions for you and your family. Learn from other young dads and easy to talk to facilitators who can help you with referrals and advice. "My experience in this program today was amazing. It brought to me the attention that I need to be worried, and that sometimes, they will do things without me seeing them, and these things are going to lead to consequences." 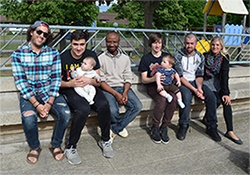 "What I love about this program is how it brings all young fathers into one community where they can all associate and socialize with other fathers and learn different things about the group and each other." "All the advice and the experience that other fathers share here...will help me to be a better father." For more information, call the Parent Talk Line at 905-688-8248 or 1-888-505-6074 ext. 7555. 285 East Main St., Welland is on the bus route. For help with transportation, call Sandy at 905-735-2566 ext. 223.